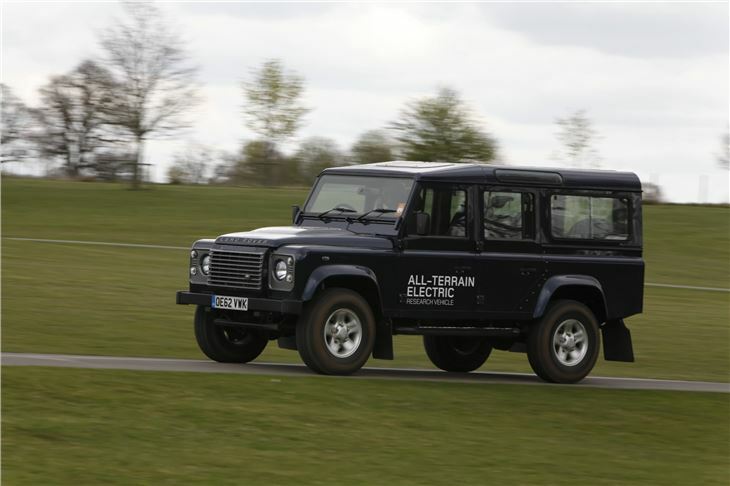 The Land Rover Defender Electric is powered by a 300 volt, 27kWh lithium-ion battery pack, mounted up front, replacing the conventional diesel power unit. It's a hefty power unit, weighing-in at 410kg (around 100kg more than the diesel engine), which obviously means the balance of the car is altered, but it's mated to the existing car's permanent four-wheel drive transmission via a 95PS Switch Reluctance motor between, which replaces the standard six-speed gearbox. That means the four-wheel drive system keeps its low-ratio transfer and locking diffs, which in theory means that off-road performance should be unaffected. It's an interesting contrast that this system creates - on the one hand, you go through an elaborate start-up procedure, where the instruments all dance away for a few secons while the electric drivetrain readies itself - and yet if you want to transfer between low- and high-range, you need to come to a complete stop (as you do in the diesel powered car), and pull on the stiff lever. Land Rover engineers have worked hard to ensure that all electrical systems are thoroughly water-proofed. 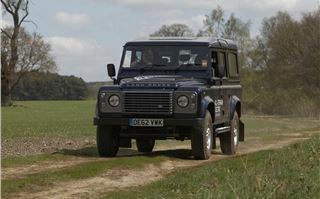 That's an interesting challenge, but ultimately a worthwhile one, as wade depth is up to 800mm from 500mm of the standard diesel-powered Defender. But as we said, this is a prototype, and these idiosyncracies are to be expected. On the transmission tunnel, there's also a terrain mode selector lifted straight from the Discovery, which alters the throttle mapping, depending on how you're using the car - for wading and tough going, throttle travel is lengthened making it possible to minutely control what the car's doing. As for on the road, the Defender Electric works pretty well, too. Some important figures worth bearing in mind with this prototype first: battery range is at least 50 miles, but with a reserve of 12.5 miles. Performance is leisurely, with a limited maximum speed of 70mph, and a 0-60mph time of around 20 seconds. But don't let the bare figures get in the way of a good story. This vehicle has been conceived for off-road use primarily - so that range and performance isn't the limiting factor you might think it is. In real terms a full charge lasts eight hours in these conditions, and that's a full day's expeditioning, as far as we're concerned. Recharge time is 10 hours, or four on fast-recharge - perfect for an overnight stop. 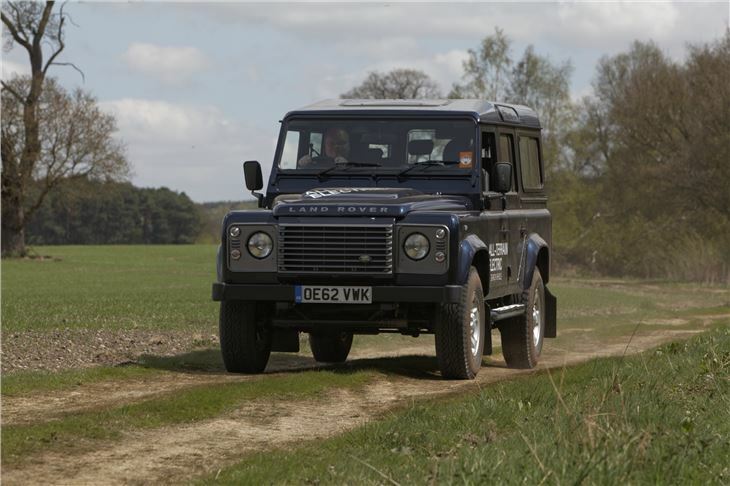 But once you're off the road, it's oh-so easy to drive compared with a six-speed diesel Defender, that you'll be left wondering why so many people are happy to change their own gears. And it's interesting that the venue of our test drive was on a typical Engish country estate, because to us, it seems screamingly obvious that an electric Defender would be the ideal vehicle for estate operations - it's perfect for this kind of operation. Equally, we'd see it happily spend its life on the farm, performing the duties expected of it all day long. Of course, you'd probably want a diesel powered Defender for long distance expeditions, but for the rest of us, we really can see a point to this one. If you do too, it might be time to go lobbying your dealer, and get the word back to Land Rover.